I got a great lesson in the difference between “less expensive” and “good quality” these past couple of weeks. Like everyone else, I’m trying to do more with less these days. So, when I got a free sample pack of shampoo and conditioner in the mail, I decided to try them. So, I tried the new shampoo and conditioner, switching from the ones I’ve been using for nearly a decade – the shampoo and conditioner that costs over $30 each for a 34-oz bottle (yep, about a buck an ounce). I was nearly out of conditioner, so it was good timing. The first couple of times I used the new stuff, although I gagged at the excessive floral smell, it seemed to do well, so I went to the store and bought full 13-oz bottles for $6 each – nearly 50% savings! Woo-hoo! And, I can get these at any time from any drug store or grocery store; I don’t have to call ahead to my stylist to order it and try to make time to get there and pick it up. Double woo-hoo! Then, just like the wrong kind of relationship, it started to go bad, just a little at first. My hair wasn’t combing through as easily after my shower. It wasn’t combing through easily when it was dry, either – in fact, it was getting pretty annoyingly tangled every time I tried to comb it. I was spending more and more time after shampooing, trying not to look like Mad Margaret from Ruddigore. 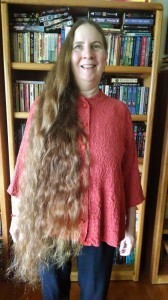 When my hair was dry, it seemed as though it would tie itself into dozens of knots, up and down from my scalp to the ends. Braiding it each night became a 20-minute frustrating chore instead of a 5-minute relaxing meditation. I gave up. I called the stylist and ordered new conditioner, and I got to use it for the first time yesterday. A-h-h-h-h… what a relief! And, I got the lesson: it is SO worth it to pay more to get quality product. If quality saves me time or hassle, or gets me something easier or faster, then the cost isn’t a cost – it’s an investment. My time and energy get freed up to go toward doing what I love to do – helping my clients and investing in new resources so that I can help my clients even more! If you’d like to cut to the chase, and get even MORE of your mojo back, sign up for my four-week speed coaching program here!